Do You Own a Convertible or Know Someone Who Does? You are at:Home»English»Life & Arts»Do You Own a Convertible or Know Someone Who Does? Have you ever wanted to participate in the Nisei Week Grand Parade and did not know how? 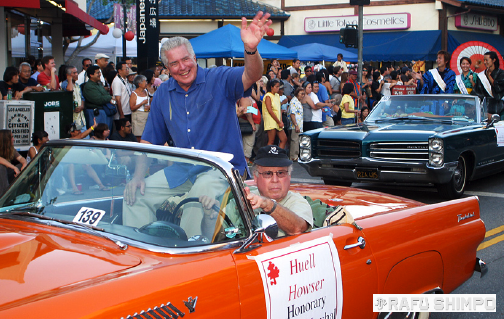 The 2014 Nisei Week Grand Parade is looking for convertibles to be used in this year’s parade on Aug. 10. The car must be able to allow the parade participant(s) to sit up on top the back seat (towards the trunk) of the vehicle comfortably. If you own a convertible or know of someone who does, and would like to participate in the Grand Parade, contact Elizabeth of Pageantry Productions at (213) 305-9653 or email her (and “cc” Mark Nishinaka at [email protected]) at [email protected] for further instructions. Let Elizabeth know that your call is regarding the Nisei Week Grand Parade and she will be able to give you the details of when and where the vehicle needs to be on parade day. The Nisei Week Grand Parade is in Little Tokyo, Downtown Los Angeles, on Sunday, Aug. 10. You and your vehicle will need to be available from 3 to 7 p.m.
For more information about the Nisei Week Japanese Festival and a calendar of events, visit http://niseiweek.org/.